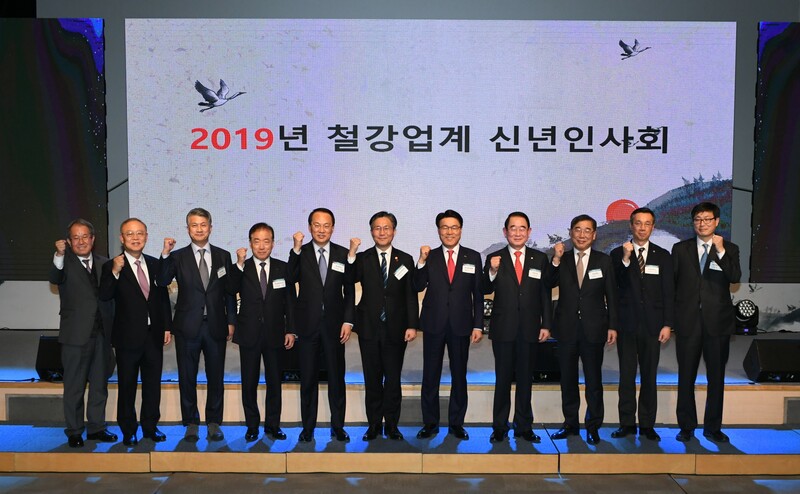 Those in the Korean steel industry got together at a New Year gathering at POSCO Center in southeastern Seoul on Jan. 10 and pledged to continue to develop the industry through change, innovation and shared growth cooperation. Approximately 250 people in the steel industry, academia, research circles, including Minister Sung Yoon-mo of the Ministry of Trade, Industry and Energy (MOTIE), Chairman Choi Jeong-woo of the Korea Iron & Steel Association (KOSA), concurrently POSCO chairman, and Rep. Park Myung-jae of the Parliamentary Steel Forum, participated in the event. The gathering was designed for the steel industry to pledge to make a fresh start and promote harmony among those in the industry. In his speech at the event, KOSA Chairman Choi said, “The Korean steel industry has preserving strength to rise to the global no.6 steel power country by overcoming a variety of hardships.” He called for challenging spirit with determination of the Chinese saying “haehyeongyeongjang,” meaning reawakening and institutional reform despite an uncertain future and hardships. Chairman Choi called for everyone to more proactively cope with rising global protectionist moves. He stressed the private sector and government’s joining forces taking active countermeasures in accordance with regulations and procedures against irrational trade actions abroad. He also called for minimizing trade conflict risks by making all-out efforts to diversify exports and explore new markets. Chairman Choi emphasized the securing of competitiveness by making the industry smart and eco-friendly for sustainable growth of the industry amid the global trend of digital transformation. Minister Sung said several hardships are expected to hit during New Year, but he emphasized that the private and government sectors will overcome hardships and make a new leap forward by joining forces with success DNA. Minister Sung said the government will build a comprehensive export support regime and focus on taking countermeasures designed to minimize the damages Korean companies suffer. He said the government plans to provide support to diversify exports by offering export financing worth 217 trillion won and expanding marketing support activities. Meanwhile, the KOSA presented a plaque of appreciation to Rep. Park in recognition of his contribution to the development of the steel industry by establishing the Parliamentary Steel Forum in 2016 and submitting numerous bills, including the ones on the safety of structures, preventing of the distributing of substandard steel products and the overhauling of a tariff structure. Rep. Park said he wished for making great achievements during the year through endless efforts despite numerous hardships. The Parliamentary Steel Forum will aggressively strive to solve the pending issues of the steel industry and spearhead a “new steel industry” for a new leap forward, he said. Among those present at the event were MOTIE Minister Sung, KOSA Chairman Choi, Hyundai Steel Vice Chairman Kim Yong-hwan, Dongkuk Steel Vice Chairman Chang Sae-wook, SeAh Steel Vice Chairman Lee Soon-hyung, Dongbu Steel President Kim Chang-soo, KISWIRE Chairman Hong Young-chul, TCC Steel Chairman Sohn Bong-rak, and KOSA Executive Vice Chairman Lee Min-chul.